So who exactly were the worst game duration and pace offenders during the 2009 season? The tables below tell the story. I'm using Minutes per Game as the standard measure of game time, and Minutes per 100 Pitches as a measure of pace. The Yankees, by far, played the longest games in the majors and took longer than any other to get through 100 pitches. The average Yankees game in 2009 lasted 3 hours and 14 minutes, requiring 1 hour and 3 minutes to reach the century mark for pitches. The second longest games belonged to the Los Angeles Dodgers (3:19 / gm; 1:02 / 100 pit.). Red Sox Nation sat through the 3rd longest games on average (3:07), and the 4th slowest (1:01 / 100 pit.). Interestingly, while the Tampa Bay Rays tied the Cleveland Indians for 4th place in duration (3:01), they tied for 3rd with the Red Sox in pace (1:01). The tables below map the average game duration and pace to 100 pitches of matchups in 2009 season. To level the playing field, I examined only regular season, 9-inning matchups, including a minimum of 4 games (in other words, no one-off interleague series, no extra-innings or rain-shortened games, no playoff effects, and fewer sample size issues). Based on the individual team stats, you might conclude that Yankee-Red Sox matchups were in fact not the longest of the 2009 season. Well, you'd be wrong: Yankees-Red Sox matchups clocked in at an unmanageable 3 hours and 40 minutes per nine-framer. For those of you scoring at home, that's a full 45 minutes longer than the 2009 mean for games matching the aforementioned criteria (2:55). Of course, if you don't have the time or the money to spend at a Yanks-BoSox game, you might instead opt for Yanks-Twins (3:31), Yanks-Angels (3:31), Yanks-Indians (3:26), Dodgers-Phillies (3:23) or Dodgers-Marlins (3:22). If you prefer interleague ball, a Dodgers-Angels (3:24) or Yanks-Phillies (3:20) matchup would have ensured a sore posterior while yielding plenty of time for beer runs. In fact, every single matchup that averaged out to 200+ minutes during 2009 included either the Yankees or the Dodgers. If you plan to witness the Yankees visit to Dodger Stadium later this June, you might consider investing in some quality seat cushions. The data tell a slightly different story when it comes to pace. While Yankees-Red Sox matchups were indeed slow (1:05 / 100 pit. ), they were a good bit faster than Yankees-Indians games (1:07 / 100 pit). The Dodgers also managed to slow the game down a bit; in 2009 they were clocked at 1:05 against the Angels and 1:06 against the Braves. In what looks like a rather odd outlier, the classic Rockies-Brewers matchup (1:06 / 100 pit) was the only non-Yankees, non-Dodgers dyad to average 1:05 or more per hundred pitches. This is rather surprising, since the games themselves were not exceptionally long at 3:19. Moreover, the Brew Crew and Rox ranked only 7th and 15th in pace. I'll file this anomaly for future investigation with data from additional seasons. On the flip side of the model, we have the teams and matchups that play consistently faster and shorter games. Matchups such as Athletics-Giants (2:21), Athletics-Orioles (2:27), and Giants-Phillies (2:29) all came it under the 2.5 hour mark. In terms of pace, the Chicago White Sox were the only team whose matchups bested 53 Minutes per 100 Pitches. In fact, the ChiSox broke this barrier in four different matchups, against the Angels (52.6), Athletics (52.7), Cubs (52.8) and Jays (52.9). It does appear that Cowboy Joe has a point. 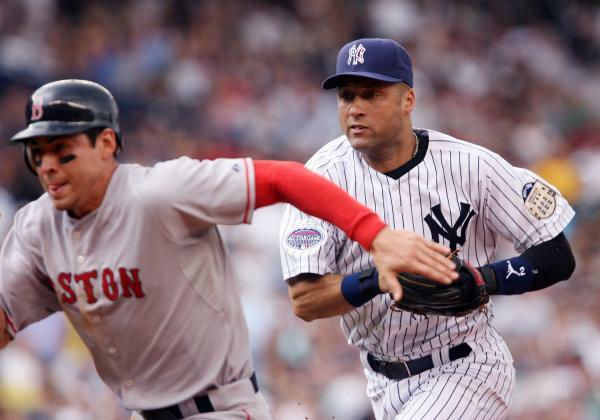 Yankees-Red Sox games were by far the longest in baseball during the 2009 season, even though they didn't meet in the postseason, and despite the fact that Yankees-Indians games were even slower. Unless I'm missing something obvious, I think it's safe to say that this has something to do with the deliberate approach the rivals take towards each other, most visible by repeated conferences on the mound and players calling time. These data are a pretty good indication that the players take this rivalry just as seriously as the fans do.